Autumn always arrives, but seldom surprises. Leaves change, grass hides and temperatures tease until winter. Everything has an autumn, if you really look at. Every idea, every concept, every life and every theme wanes at some point in its existence. Autumn doesn’t have to be a time of poetic decay. Rather, it should be seen as a time for notice and reflection. For public service, autumn is another season of work and attention. It is another opportunity to slow down and lessen the distance between ourselves and the public we serve. In autumn, logic models for program evaluations are completed, results from statistical packages are analyzed and strategic plans for accomplishing goals and objectives of the next quarter and the following year are designed. Every autumn, public servants pour over remaining budgets, unmet program specifics and any new issues that emerged during the year. These servants answer questions, make hard decisions and determine the direction of new and existing policies and programs. It was at the end of autumn in 1882 that the Pendleton Act, creating the merit system within the U.S. federal government, was passed. The Act’s passage followed decades of suggestions for reform of the spoils system which guaranteed one-sided appointments to government positions for the supporters of election winners. The Pendleton Act brought an autumn end to that system and ushered in personnel reforms that prior to its passage were little more than idealistic notions. Autumn allows the public servant to assess policies, to evaluate patterns of implementation and to measure the effectiveness of the methodology he or she used while administering a particular public good. That assessment can lead to suggestions for reform, to immediate program change or to the elimination of one or more elements that failed to deliver the needed results. Autumn is usually the time for these kinds of decisions and the most likely time for serious consideration for policy changes. In the not-too-distant autumn, the U.S. electorate will go to their perspective voting booths for mid-term congressional elections. Whatever the outcome, whether elections change the House or the Senate, public servants will continue to introduce and open up the possibilities toward equality for those we serve. Our work does not begin after an election; it began long before and continues long after. Public servants stride through the ruins of failed election platforms and awkward concession speeches to hold steady the promises of legislation. Those promises have been the theme of our collective duty since George Washington formed the nation’s first Cabinet. Ideas for reforming the public sector are short-lived or have become unheard of in the current environment. Sure, rich donor countries providing large grants and technical assistance to poorer economies insist on reform, which for the most part is temporary and symbolic. Reform is emotional and is an attractive way to say ‘let’s do something about bad and ineffective government.’ Larger economies, for the most part, do not embrace reform talk because their streets are clean, their buildings are painted and their potholes are fixed within days. Reform means one thing to unstable governments and another thing to ones that appear more operational. For public administration, reform needs to become a part of the legacy of government’s organizational and agency development. That is not to say that reform should become the default mechanism for policy or program change. No, to the degree that it is relevant, reform should become a part of the evaluation of government functions. Reform is necessary. It provides a mechanism for correction. One reason for the lack of reform and our inattention to program correction is that many believe that reform is revolution. Many believe that reform is too personal and that it serves as an indictment of government. Nothing could be further from the definition of reform. Public servants know how to correct what is often wrong with irrelevant and misplaced policies and that does not mean the wholesale elimination of well-intended legislation or the dismantling of entire bureaucracies. What is often reformed are poorly written objectives, the misapplication of an inaccurate values or programs that no longer serve the demographic they were designed to serve. Including reform as part of the autumn assessment of program goals would help to make reform as natural as program budgeting. I believe that reform, as notion and as reality, will make a comeback. Albeit, a slow comeback, but a comeback nonetheless. The public servant that adopts an appreciation for the changes a consistent reform of policy and program can render will help to inform the policy process in real-time. And, isn’t that what we already try to do? A formal recognition of reform operations will add to the work public servants do in season, out of season and especially in Autumn. Image: Lisa Saye, Ministers and Deputy-Ministers in Cambodia. 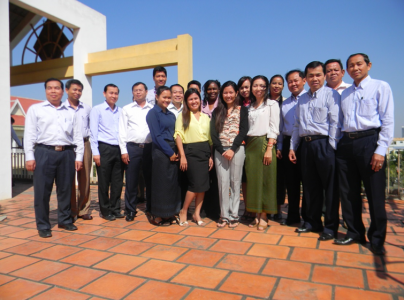 Photo is the property of Lisa Saye and was taken in Phnom Penh, Cambodia at The Ministry of Civil Service. This a timely article. Once again brilliantly written. It is time for a new season in government, and introduction of innovative ideas that can revolutionize government processes and operations. Government as the ‘administrator’ of the country has a fiduciary responsibility to ensure optimization of taxes collected and mitigate the effects of social and economic challenges on its citizenry. Once the government is incapable or have challenges in achieving this simple object there is need for reform or a revolution. “Autumn for the Public Administrator: Evaluation, Service and Reform”, reminds me, once again, of the inseparable relationship and interdepence of the critical stages of the policy process: policy formulation, policy implementation and policy evaluation. Where does the Autumn lies? Autumn arguably follows periodic evaluation of Public Policy, leading to further policy initiation and formulation; then to implementation and eventual evaluation. The process is continuous and sometimes unending. Policy process is a Reform process with the overall goal of policy change or social change. Dr. Saye’s article has pointed out the historic role of Public Administrators in the dynamic process. Bravo to the distinguished Scholar! It is necessary to have the intention of reform, which I believe is one of the most important challenges facing reform or change. Regrettably, reform in many countries is failing because of the entrenchment of the state’s deep pillars, which are originally benefiting from the rifts of the existing system, which take a hierarchical shape in the structure of the institution. Therefore, we find that the reform or change faces great challenges. Great job again! Autumn can definitely bring about positive social change. …….indeed everything has an autumn. This article is simple, brilliant ,and breathtaking. “Reform should become a part of the evaluation of government function”. Nothing can be further from the truth. Government has a vital role to play in ensuring the quality of life and chances for upward mobility and ensuring all have access. Throughout history its government who has created many of the injustices we face in this country, often times through legal actions. The time is ripe for those of us in public service to rise up and get back in the game.